The recent news storm over advertising on the Sydney Opera House sails polarised the country to a point of hysteria. On one side 2GB broadcaster Alan Jones squawked about whose authority it was to decide if Racing NSW’s The Everest should be advertised on the iconic landmark, and in the process pulled many a politician into line behind him. On the other almost a quarter-of-a-million people signed a petition declaring their outrage, with hundreds turning out to protest the night the divisive advertising was beamed onto the building. Whether you agree or disagree on what took place, just about every media outlet in the country, and plenty overseas, filed on the fracas. In fact a 14-page report compiled by media analysts Isentia tallied up the conversation on radio, television, in print and online over eight days and counted $21,565,731 achieved in publicity (by equating what the time or space in the media would have cost if it was bought in advertising). But depending on what media you followed the story through, you could have been served up a different point-of-view, which in turn might have influenced your take on the story. For example if you listen to Jones’ program, watch Sky News or read any of the News Limited newspapers, then you’d more than likely be served up editorial favouring the promotion. Nothing demonstrates this more than several newspapers running an ad on their front page for the $13 million race following the now infamous race draw, with an accompanying editorial inside using language praising the gala evening while pouring cold water on the protester’s efforts. On the other side of the equation, centrist or more left media turned up the heat on Jones, the NSW government and any other politicians who generally weighed in on the debate. Why does this matter? Well it demonstrates a phenomenon called the propaganda model of communication, put forward by Edward S. Herman and Noam Chomsky to explain how propaganda and systemic biases function in corporate mass media. Put simply it says that things such as advertising, media ownership (and its concentration), flak and fear ideology are all filters present in our media that dictate how our news is served up. Their seminal book released in 1988, Manufacturing Consent: The Political Economy of the Mass Media, dissected a number of major world events (including the Central American crisis, the KGB-Bulgarian plot to kill the Pope, and the Indochina Wars) and showed how government influence, media ownership, and political and religious bias in the newsroom all counted towards what was written and served up daily in the media. In each of the case studies they found the information published by the media either left out critical facts that could have presented a different story, or just reported on false information without checking whether it was true or not. Sound familiar? Today it’s manifested into what’s called fake news, a term that’s not new, but crystallised most recently through the 2016 US election, the growth of social media, and a never ending stream of made up stories. The algorithms of social media have also come under scrutiny in the way they determine what you read. In a never-ending quest to ‘personalise’ a users experience, platforms such as Facebook, Twitter and Google News learn what you’re clicking on, and then narrow the ensuing information it serves up to you to fit your profile. So who’s best suited to curate our news? An old school news editor whose learnt the craft over three decades and makes decisions based on his company’s and his own information bias, a radio shock jock that may have close links to business interests, or a computer? And what’s the best medium to access it through? In Australia research released by Roy Morgan this month reveals over 13 million Australians (65.6%) now say TV is a main source of news including over 12.6 million (62.3%) specifically nominating free-to-air TV. 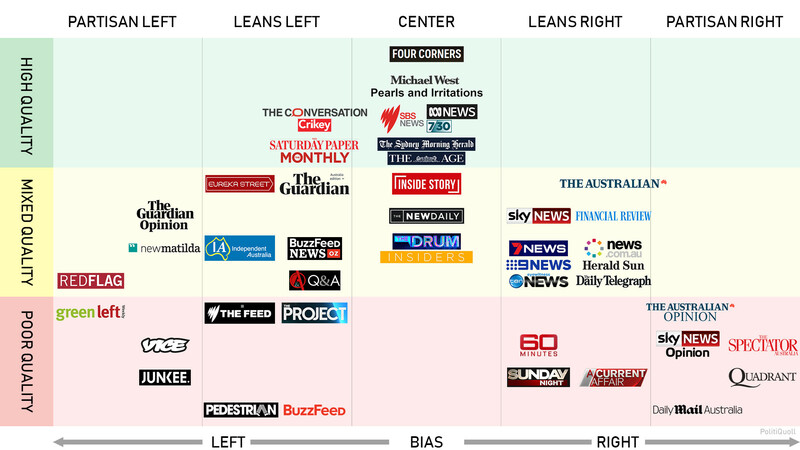 The medium is also regarded as the most trusted source of news by nearly 7.5 million Australians (36.7%) – ahead of any other forms of competing traditional or digital media. And who do we trust? Interestingly the BBC topped a recent analysis in the US created for Research Intelligencer by Brand Keys at 90% trustworthy, followed by Fox News at 87% and PBS at 86%. There is more information created and curated on an hourly and daily basis than ever before. Understanding where it comes from and why is now just as complex as the processes and systems that serve it up.